Modern golf courses usually call for target golf, where you loft your shots like darts from tee to fairway and fairway to green. But if you've ever travelled to the courses of Great Britain, or if you play much of your golf in the wind, you're well aware of the value of a low shot. I think of it as a long punch shot. The key is to push the ball outward on a low trajectory rather than lofting it into the air. 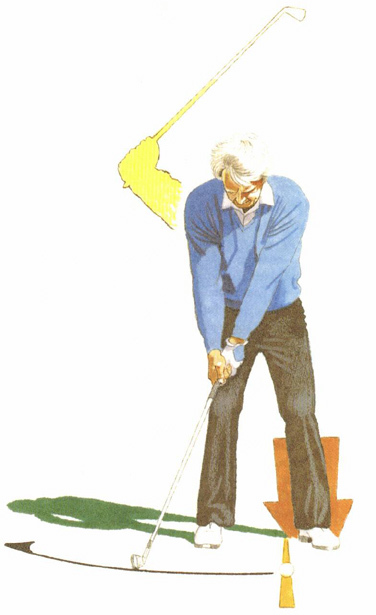 You can pre-program this effect at address by setting up with the ball a bit back, just behind your left heel. The majority of your weight should be on your left side, but you should not put so much weight there that you fall ahead of the ball as you get to impact. I also find that a good way to keep the ball low is to keep my body low during the swing, so I squat down a bit at address. The swing should be controlled, and your backswing should probably not go beyond the three-quarter point. But the key is in the takeaway, which should be as long and low as possible. If you take the club back very low, then you will return it to the ball that way, and it is that shallow angle of attack that will keep the ball low.